In order to have a healthy life in our modern society, we cannot ignore the effects of “Ions”. There are many Ions in the air we breathe, and the percentage and number of Positive Ions and Negative Ions change depending on the time and place. An Ion is a particle which has electricity. Ions are being made in the air we breathe so fast that 10 to 20 Ions per cubic centimeter are being made per second. There are 200 to 500 Ions in 1 cubic centimeter of ordinary outdoor clean air, and 100 to 200 Ions in 1 cubic centimeter of clean indoor air. Many studies of the relationship of the Ion (especially the negative Ion) to our health have been made by professional researchers who agree that our health is dependent on the amount and quality of Ions in the air. The human body consists of billions of cells, and each is enclosed by a cell wall. This cell wall performs many important roles, and one of these is to absorb nutrition and eliminate waste material. The function of the entire cell (including the cell wall) can be normalized if there are enough negative Ions within the cell as well as outside the cell. The reverse holds true if there is a lack of negative Ions, and too many positive Ions within a cell. Thus, absorption of nutrition and elimination of waste material cannot be done effectively. As a result adult diseases such as hypertension, arteriosclerosis, cerebral apoplexy, and cancer occurs. Other afflictions caused by an improper number of Ions in the body include anemia, allergies, infirmity, shoulder pain, lumbago, rheumatism, neuralgia, headaches, habitual constipation, gastroenteritis, hepatitis, kidney trouble, unbalanced autonomic nervous system, and insomnia. Too few negative Ions in our body can cause many diseases, and have a dangerous effect on our overall health. So what are the benefits of Negative Ions? Through research done by Dr. Takada Maku in Japan, it was discovered that when negative Ionization is introduced, the Ions in calcium and natrium (salt) in the blood increases, and the blood is purified by increasing blood alkaline. When the amount of negative Ions in the blood is increased, the function of a cell is activated. The electrical material exchange speeds up the cell function, and as a result, nutrition is fully absorbed by the cell and waste material is eliminated. Metabolism is increased and the function of the cell is gradually revived. Clinical research at a Tokyo Dental College Hospital sponsored by the Japan Red Cross in Shinjuku found that negative Ions have a positive effect in the control of the nervous system in the relief of tension. At the Public Hygiene Class at Shinsa University, clinical research showed the following: most people experienced good effects in relation to their internal organs after a few weeks of usage. The stomach showed the fastest effects, and the function of the liver was improved which counteracted many poisons. Dr. Koudo Michio reported that symptoms of paralysis had been dramatically reduced after supplying negative Ions for 30 days. After 90 days of treatment, the patient had recovered completely. Dr. Koudo Michio said that the negative Ion treatment is very effective for light shoulder sclerosis, as well as, symptoms of paralysis in fingers, arms, and the whole body due to occupational effects experienced by the nervous system. In Kumamoto Hospital Japan, Dr. Nagayama of the Kyoto Pain Research Institute found the pain relieving efficiency of the negative Ion had a notable effect on most headache and neuralgia cases. 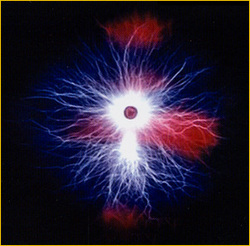 If 600 to 1000 volts of negative potential is applied to an insulated body, more calcium and sodium minerals in the circulating blood get ionized, thus changing an acidified body to an alkaline body. Although it uses a high voltage, since there is no current flowing there is no danger. It is effective for stiff shoulders, headaches, insomnia, and chronic constipation. When you leave the Bio-Mat™ mx on it will fill the room with negative Ion particles. You may notice a layer of dust accumulate because the negative Ions are changing the particles in the air causing them to fall.